The first chapter of research for a new theater piece: Un opéra de papier (a paper opera) by Le Fil rouge théâtre. How to speak about death and loss to children and elderly persons at the same time? What are the rituals, the music, the special gestures that go with? During the lab residency, I filmed various encounters between artists and children or older people and I recorded elderly women singing lament and loss songs in a retirement home. 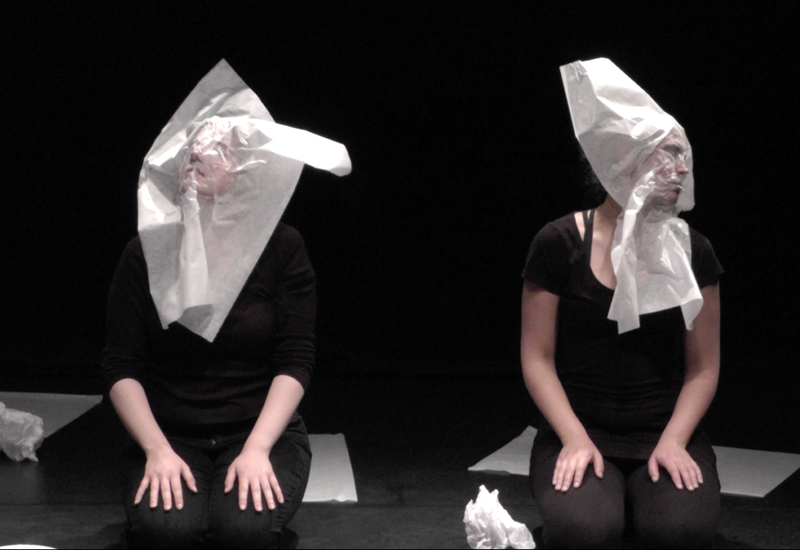 While doing that, we went on stage to experiment with wrapping papers, creating the first images, movements and singing parts of this Paper Opera. Created and directed by artistic director Eve Ledig, with Canadian visual artist Sarah Booth, music composer Jeff Benignus and Louise Allaire from Theater Les Gros Becs (Québec). From the 3rd to the 11th of May at Théâtre Périscope (Québec City, Canada). Theater creation on sept. 2018.